Southport, CT August 20, 2008 – Sturm, Ruger & Co., Inc. (NYSE: RGR) is proud to introduce a special, limited-production Ruger® New Vaquero® for the Cowboy Fast Draw Association (CFDA). This high-gloss stainless steel New Vaquero comes with the “old-style” Vaquero hammer, giving fast draw shooters a time-saving advantage by providing a more natural fit for this style of shooting. Only 1,000 of these models will be produced and they will bear a special serial number sequence in honor of the Cowboy Fast Draw Association: CFDA-XXXX (0001-1,000). Ruger New Vaqueros are designed to offer the original “Old West” single action look, size and feel. Built on a mid-sized steel frame, New Vaqueros have a patented Ruger reverse indexing pawl, which positively aligns the cylinder with the loading gate cutout for easy loading and unloading of cartridges. A beveled cylinder for easier holstering, checkered “hard rubber” grips, and a larger crescent-shaped ejector rod head in traditional form are additional features designed to make the New Vaquero one of the most user-friendly and durable single action revolvers on the market. 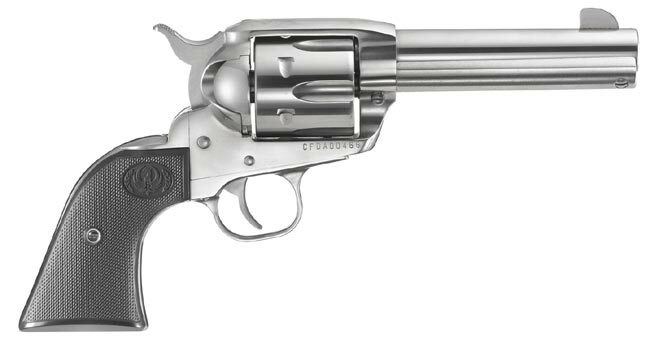 For more information on the new Ruger CFDA New Vaquero, a Davidson’s Exclusive, visit www.galleryofguns.com or www.ruger.com.